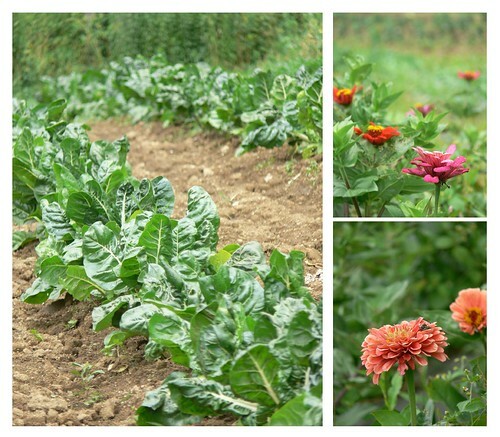 Recently, Cody and I, along with others, were extended an invitation to take a tour of the farm that we receive our weekly share of veggies from. 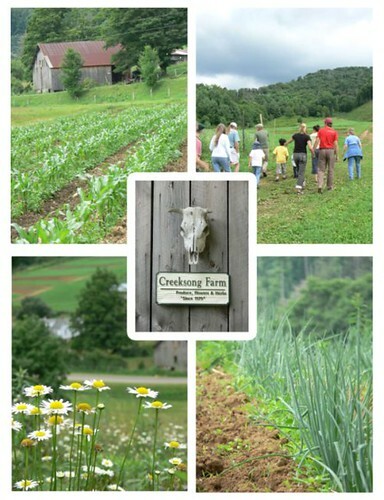 Ever since we joined Creeksong Farm's CSA*, I have wanted to go for a visit and take pictures, but for whatever reason we were never able to work it out. Thankfully, they hosted an ‘open house’ for ALL of the members to enjoy. It ended up being a terrific opportunity to connect with where our food comes from, as well as with the other members! 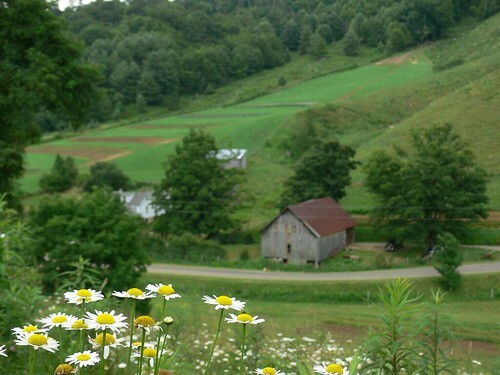 It took place on a Sunday afternoon a few weekends ago and required a drive through the Ashe Country countryside—a place where I would love to settle down. Among the first to arrive, we were welcomed with warm smiles and friendly faces, along with a delicious spread of fingers foods and tasty beverages. 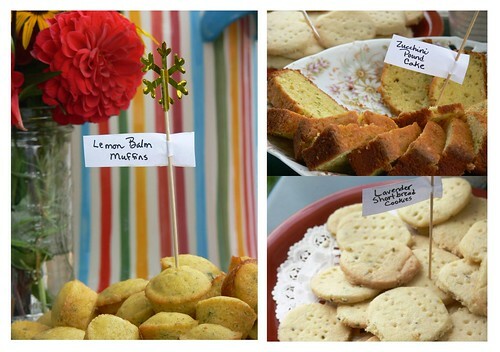 The snacks were superb!! 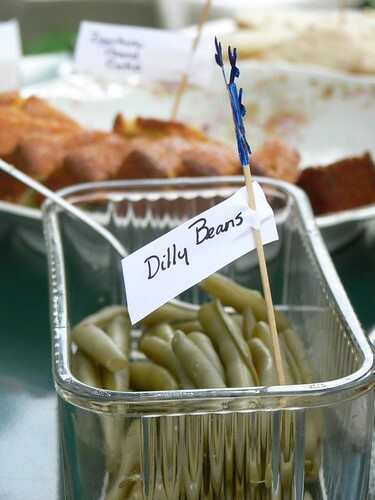 My favorite were the Dilly Beans....those things were delicious!!! Soon after we settled in, other members began to arrive and joined in on the pow wow. Everyone quickly became better acquainted while waiting for the rest of the guests. Meanwhile, Jeff (The Chief), was preparing to lead the way to the first set of gardens where we saw zinnia’s, chard, broccoli, basil & a few other farm-fresh goodies that have made their way into my kitchen. 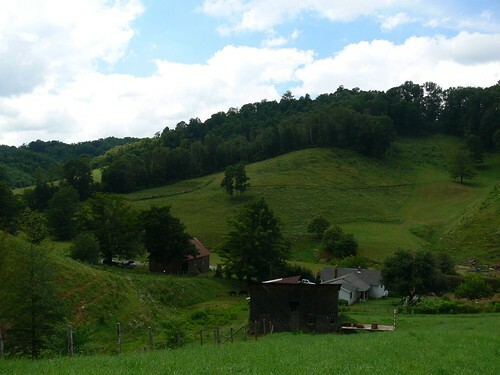 From there we got a nice look at the surrounding acres which consisted of rolling hills and plush pastures saturated with different shades of green. In total, they have 60 acres that they have been accumulating since 1979! What a spread, huh?! With every ginger footstep I began to realize how much work has to be put into an operation such as this. Not that I didn’t know before, but seeing it from this angle offered a perspective I couldn’t have really appreciated otherwise. I am no farmer. In fact, I have a black thumb! But seeing what they accomplish with my own eyes makes me want to become better at it albeit on a smaller scale. I truly do appreciate all the hard work they have to do to ensure that we stay well fed. Clearly, it is not as easy as it may look--not that I ever thought it looked easy! After seeing the first garden, the bunch made their way down the street in a parade-like fashion where we saw two more sizable plots. One was filled with golden squash, zucchini and corn while the other, requiring a bit of a climb, housed the infamous (green) onions, which we have grown to love :D.
Following the slope of the hillside put us in a great position to survey an overview of the homestead below where we spent a fair amount of time admiring the landscape before hiking back down through the hollow. For some, though, the fun was just beginning. The kiddies got to go on what seemed to be a thrilling tractor ride around the valley! 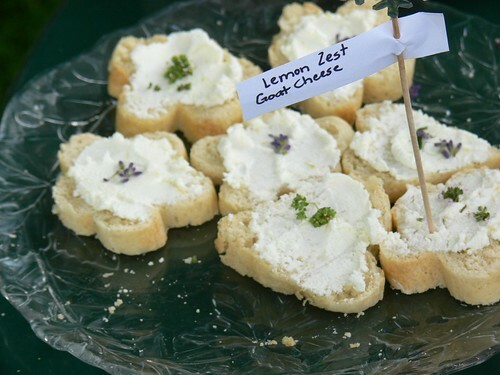 I, on the other hand, went back to the snack table to polish off, I mean sample, a teeny bit more yummy goodness before saying our last farewells. I can’t tell you how thrilled and relieved I was that the rain held off so that we could finally visit their little slice of heaven. I felt so at home out in the country. It was a fantastic way to spend the day! *You may remember a guest post graciously crafted by Cody regarding the benefits of joining a CSA back in January. 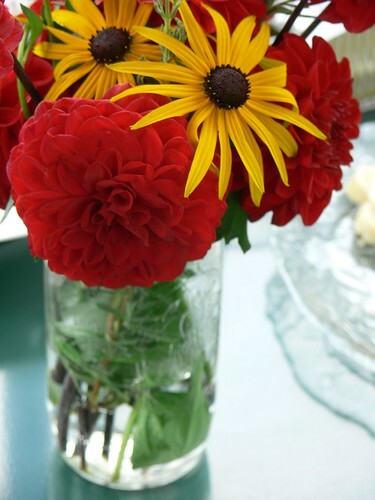 If you missed it or are not aware of what a CSA is, I strongly encourage you to revisit that post: Fresher Food for Less. 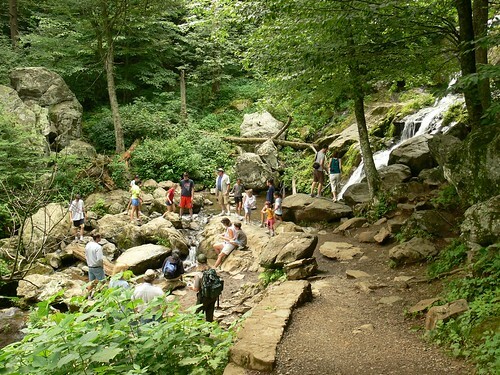 For our last day in Shenandoah National Park we picked this trail because there were not one, but two waterfalls! The round trip hike of 3.2 miles is moderate on the way down, but the return climb is STEEP! So steep it seems that you are pretty much at a half-jog the whole way down. Almost too quickly we reached the Upper Falls, from there we decided to bypass it because of the crowd and kept going until we got to the Lower Falls. After taking our time on the sharp switchbacks, the 63 feet of water furiously spilling down the rockface came into our view. I charged toward the small landing beneath the falls, but was stopped dead in my tracks by what I though to be a live snake! I screamed!! Cody, my knight in shining armor, quickly came to my aid. Upon closer examination we realized it was not moving and was a little bloody--someone killed it. Strategically, we removed it from the path so no one would have a heart attack from having the daylights scared out of them, like I almost did. A little more cautiously this time I made my way down and set up my tripod to get a picture. I didn't have too much luck here because the sun was shining directly on the top of the falls (overexposure), so I thought best to move on. On the way back out we stopped to see the Upper Falls, it was still crowded. The grotto-like setting was nearly impossible to capture without a moving subjects hopping into the scene. Somehow, I got lucky and was able to fire off a few shots. Midway, I remember thinking to myself, "This isn't too bad!?" I even protested saying so out loud just in case I would be jinxing myself by doing so. Of course, I did! That's where things started going "downhill".....It was BAD, real BAD! I almost wanted to warn everyone we passed to turn back, especially when we came to a lady resting on a bench on the way down! She had no idea. Without saying a word, we trudged along. There were moments that I wanted to die or either pass out (just a tad dramatic), but without incident, we made it back to the trailhead. 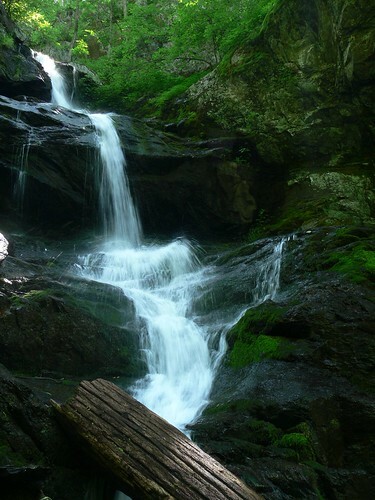 There is nothing that I like more than to see the awe-inspiring beauty of a flowing cascade. What can some times make that desire difficult to achieve is the time and effort it can take to get there. 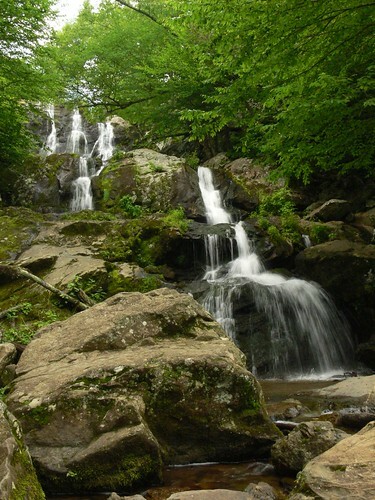 Since there are no waterfalls that are visible from Skyline Drive in Shenandoah National Park, to see one you must be prepared to take a hike. Cody and I were looking to maximize our time, and at the same time minimize exhaustion, so we set our sights on some of the shorter and less difficult treks. Of the nine waterfalls in SNP, though none are easy, there are a few you might find more manageable, but every bit as beautiful. This particular waterfall appeals to a wide audience because it is easier to get to, which means that it can be pretty popular. Even so, we thought the 1.4 mile round trip would be a great excursion to start off with. 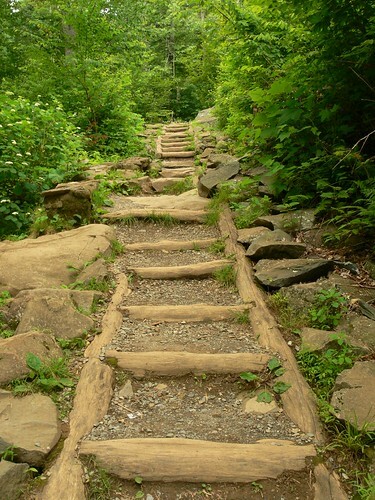 The trail hugs Hog Camp Branch as you make your way down the tree-lined path, which can become steep at times. The clouds were being even less cooperative, so somewhat frustrated, we made our way back across the river to begin our ascent. I remember taking a break or two on our way back up, but all in all, it wasn't so bad. After a short nap at the campsite we awakened with vigor and were ready to tackle another trail. This one was really close to the Big Meadows campground, our homebase. Another bonus was that this was a short stroll at 2 miles. The footpath to Lewis Falls was strewn with rocks and can be tricky, so sure footing was a must! 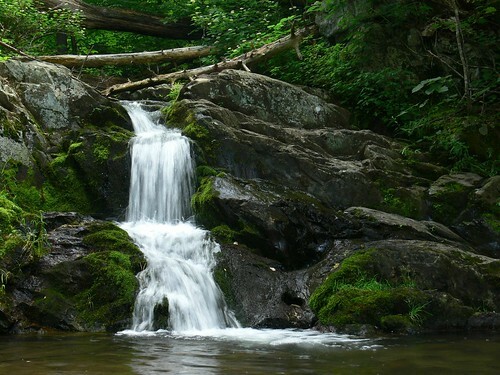 Once the sound of rushing water becomes louder a panoramic view of Pine Grove Hollow opens up before you. 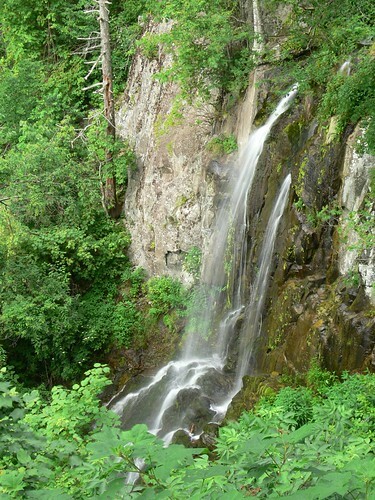 The end brings you to a rock-walled observation area where you can view the 81 foot falls from afar. I felt a little jipped because that wasn't what I expected, but it was still lovely. Other than having to navigate the rocky terrain, the return hike was fairly mild. We did, however, almost cross paths with a skunk, but thankfully he was in his own little world! 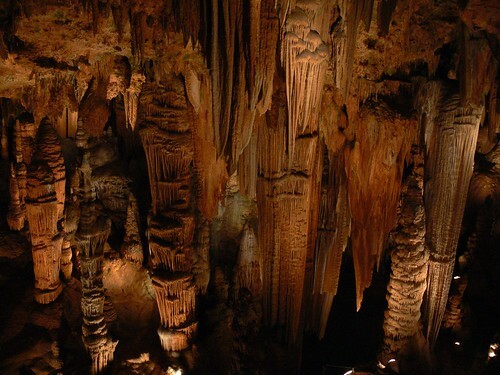 Step into a world where enormous underground chambers are filled with countless stalactites and stalagmites that are 4,000,000 centuries in the making. Cathedral-sized rooms with ceilings 10 stories high are home to a myriad of fantastical forms. 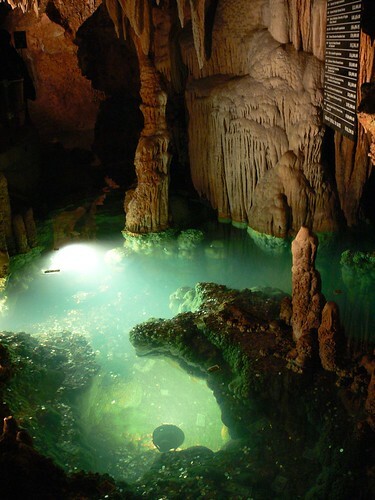 This 'subterranean wonderland' is a place where natural curiosities can be experienced and imaginations can be exercised around every jagged corner. 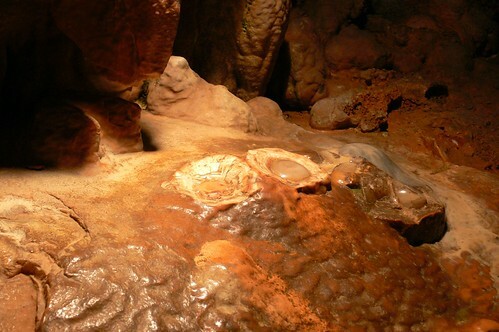 As much fun as it may be to think up your own variations, the self-guided audio tour will answer questions that you didn't know you had, as well as share historic and geological information about the cave. 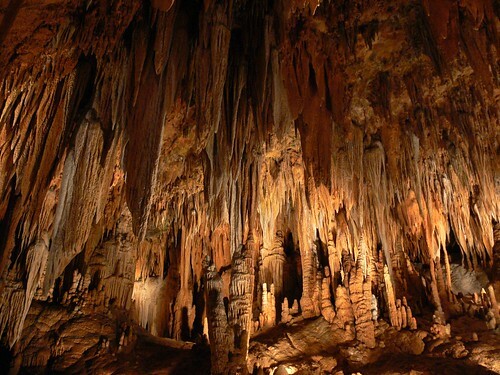 During our tour, I recall many jaw-dropping moments as we wound our way through the grand cavern. For instance, my favorite and most astonishing discovery was the sea of stone that seemed to go on forever. After realizing that what we were actually looking at was a reflection of the ceiling, I was still in disbelief about what I was seeing!? It was very appropriately named Wonder Lake. I don't know how long it took other people to navigate their way to the end, but the brochure suggested a 1 hour time frame. We, on the other hand, took 2 hours! I didn't mind letting everyone pass us because we weren't in any hurry. 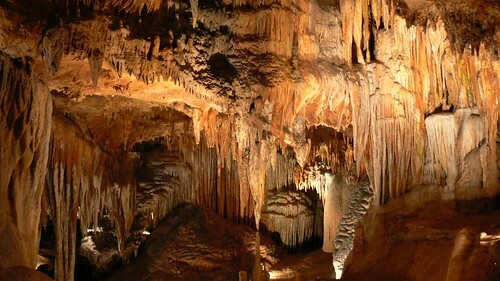 In fact, we took extremely long pauses at nearly every juncture to bask in the magnificence of this natural landmark. 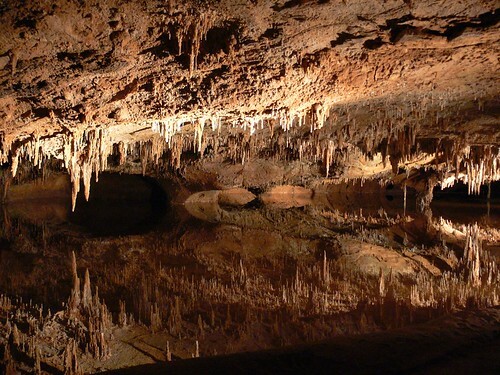 Traipsing around underground in Luray Caverns wasn't the only thing we did on our most recent trip to Shenandoah Valley National Park. 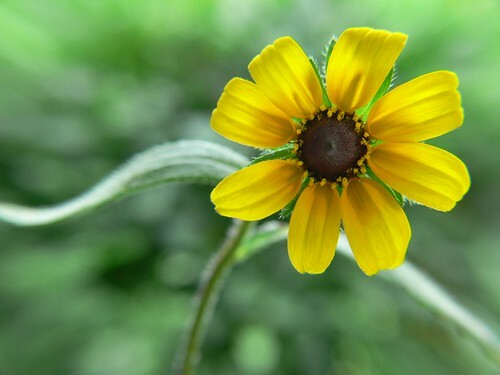 I still have more of natures wonders to share with you! 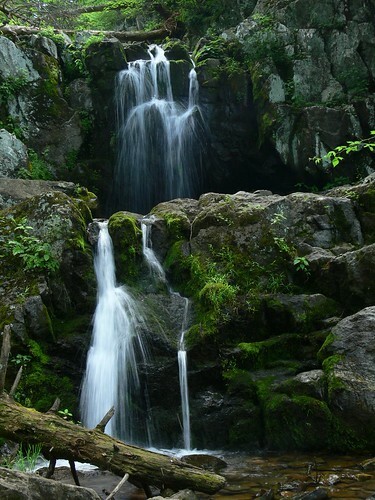 Waterfalls of Shenandoah National Park! Wildlife, Wilderness and Waterfalls! Oh, my! We experienced it all....and then some! I want nothing more than to tell you the details about our camping trip. Instead, I need to be a grown up and focus on meeting deadlines this week. Hopefully, I will sneak in some time and have a field trip ready for Friday! 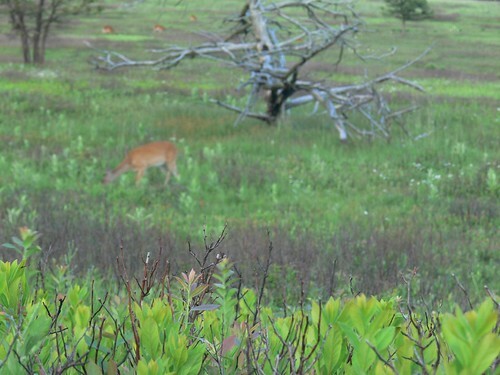 Shenandoah National Park was teeming with wildlife. 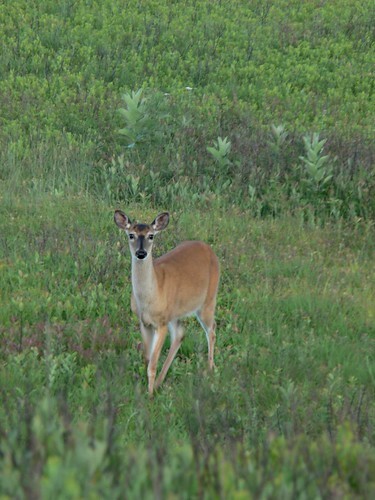 Deer were the most abundant! And, bold enough to walk straight through our campsite. O', and how cute the fawns were curled up, basking in a patch of sunlight just behind our tent one morning. But, after seeing so many (100+), we were like, big whoop. A deer. However, we did have a few other encounters that were a lot more intriguing!